1. Never forget a warm up/cool down before/after training/trials. Normally, I do about 15min of a warm up (more if it’s cold or the dog was in a crate before – vs. free in the house or yard), starting with some trotting freely, then trotting in smaller&smaller circles (both directions), then some cavalettis, side cavalettis, backing up, crawling and sit to stand and back. For a cool down, I do the same in opposite order, then do some active stretches (frog, front feet lifts, crosses, cookie on a shoulder/hip/chest/above the head) and end with a cool down walk. 2. Make sure the dog is well conditioned without any extra weight and no soreness. Obviously, any extra weight means extra stress on their body, so make sure there is no extra weight. Maintain good muscle mass by strengthening tricks - strong core is essential to keep them injury-free, strong rear end for powering forward and strong front for taking an impact of landing. Make sure they get enough rest days as well and do regular physo check ups. When I suggest the dog is not moving well and might have a problem, I often get answers like "no, he was x-rayed and his hips are perfect"??? If I'm not mistaken, the dog is not made just out of hips??? Most common, the problem is not in joints at all, but muscles or other soft tissues. 3. Check equipement to make sure it's safe. That means bagging down the tunnels well, checking the weaves are pinned down well, so the base won't move if the dog hits a pole and dog-walk ramp supported well (if designed that way). If at all possible, use PVC jumps and avoid metal wings as much as possible. If there are only metal wings available, avoid slices - and if you use them for wraps without a bar, remove bar holders. 4. Don't train if it's too hot or too wet/slippery. I still love outdoor agility the most, but make sure to skip it when it's not safe! Appropriate indoor surfaces are turf or well prepared sand/dirt. 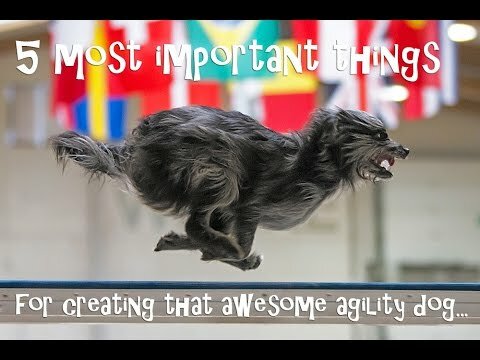 I don't like mats or carpets for agility - perfectly fine for tricks though! What is not fine not even for tricks are tiles and hardwood. 5. Keep the sessions short, intense and fun. Avoid drilling and stop a session before either you or the dog gets bored, tired or too hot. If you want the dog to give it all, give it all yourself. Run as fast as you can, stay connected with the dog when you play and make it clear when you are running/playing and when they have a break. Also see You can talk, you can smile, you can have fun article. 6. If something scary happens, refocus the dog on something else with her favorite tricks and then stop a session or move to something completely different. Read Dealing with Fears article to be prepared and respond correctly. 7. If things go wrong and you keep getting a mistake after a mistake - stop the session! Or even better - video it first, so we can see what went wrong and avoid it next time - and stop a session or move on to something completely different. Make sure to read Ending a session on a good note? article. 8. Don't keep redoing the same sequence when things go right either. It only teaches the dog pattering and she will learn to just redo what worked the first time. That way, she will only learn to ignore your cues + you might be learning that your cues are sufficient even when they aren't as the dog will keep doing the right thing thanks to guessing also when your cues would desperate need the feedback that they're not sufficient. And why redo things that you can do already anyway? Go for things that are still hard and give you mistakes as well - always aim for about 80% success rate, that's when they learn the most. 9. In time cues are super important!!! Late cues make turns unpredictable and dogs more prone to falling and struggling, trying to turn without having time to reduce speed first. And not just that - consistently late cik/cap cues (and I would say about 80% of my Foundations students are consistently late with cik/cap at first) teach the dog cik/cap means “turn NOW” - and will cause refusals once you do say them in time! A dog who fully understands cik/cap will never have a refusal – that’s what makes verbals so much cooler as just body language. But they can only understand them fully if they’re trained and used correctly of course. Doing all your training in your backyard and then expecting the dog to perform the same in busy trial environment is unfair. Make sure to expose the dog to trials well before you first enter them and make them a super fun experience for them. Also take them to city centers, in front shopping malls and other busy places to help them see distractions are a normal part of life - and play and tricks are only even more fun with distractions around! If they are happy to play and do tricks in environments like that, they will be able to do agility as well. Set your goals??? - Or just enjoy the moment? Thank you so much for this list Silvia! Everyone should take it to their heart and keep it in mind. What to add?? You’re simply special and best teacher ever!!!! ❤️ I’m not only a handler and a dog lover who like agility but a vet too, so I know how important is safe healthy training! Great article!!! I especially like the tunnel bags section. I really, REALLY hate it when tunnels are not well secured. People don’t think tunnels as very unsafe, but they sure are! Also the quit when things don’t go well. I also hate seeing people keep trying and trying and trying. I’m very particular about that. Oh and the one about something scary happening. Oh I see people try so hard to put a dog back on the teeter if they get frightened. NOOOOO!!!! Just go do something else! And revisit the teeter another way! Great! Can’t wait to get mine! Where are some options for buying these anti slip softer tunnels? When will the Foundations Fun course start again? Next Foundations starts on February 27.